It was very close but Ben Hudson successfully defended his national title yesterday after completing the 160km ride in very wet conditions at the 2016 Equestrian Australia Endurance Championships held at Sterling Crossing Endurance at Imbil on Queensland’s Sunshine Coast. 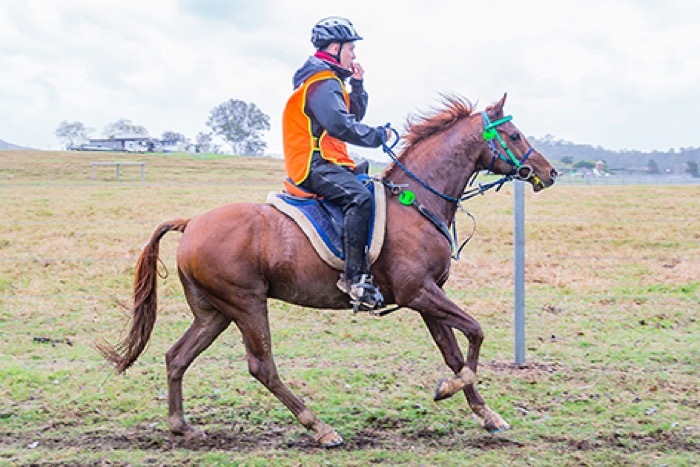 Despite heavy rain and tough conditions, Hudson who rode Cap Braveheart from Oso Arabians in Table Top New South Wales, achieved the impressive time of 10 hours 15 minutes and 30 seconds, averaging a speed of about 15km per hour, while runner-up and local Kaylea Maher galloped in only three seconds behind. Matthew Sample, owner of Sterling Endurance Arabians and founder of the club, said he was delighted with the outcome of the inaugural endurance event to be hosted at Australia’s first purpose-built endurance venue and congratulated Mr Hudson on the outstanding result. “Ben had an excellent ride, especially considering riders rode in rain for most of the time which adds significantly to the effort needed to complete the course,” Mr Sample said. Second place went to local girl Kaylea Maher on A’Landell Ali from Rushoz Endurance in Imbil and third went to Naomi O’Shaughnessy from Victoria on Castlebar Party Girl. This win looks certain to secure Hudson’s place in the Australian team travelling to the World Endurance Championships in Slovakia in September this year. Several of the prospective team members competed at the event which was their last opportunity to impress the selectors who will make their decision over the next few weeks.